Marvellous Malt Whisky Gift Ideas from Greatest Gifts. A fine selection of quality Malt Whisky gifts. The lovely finished product of Malt Whisky makes a fantastic gift, so why not surprise a loved one with a lovely Personalised Whisky Bottle? There are so many fantastic Malt Whisky gifts in the UK and here at Greatest Gifts we have a selection from various retailers for you to compare and save time and money. Personalised Malt Whisky Gift Sets and Single Malt Whisky and Newspaper are great gifts for those special occasions. Scottish Whisky, or Scotch, basically comes in two forms; Blended, where there are two or more whiskys combined in various recipes to make an improved product, and Single Malt, which is made by distillations at a single site and by just a single producer. Usually the Blends are made from mixing grain (cheaper) and malt whiskys and the Single Malts just use only malt. The Scotch Whisky Regulations state that a "Single Malt Scotch Whisky" must be made exclusively from malted barley. It must be distilled using a pot still, and it must also be aged for at least three years in oak casks of a capacity not exceeding 700 litres. The United States of America however, has it's own regulations and some American Single Malt Whiskey is in fact produced from malted rye and not malted barley. Barley, water and yeast are the only ingredients needed in the manufacture of (barley-based) single malt whisky. The action of "malting" the barley requires soaking the barley for 2-3 days in water, after which it germinates to convert starch into fermentable sugars. Next it is dried by heating and sometimes even smoke from burning peat is added to give it a smoky flavour and aroma. Next the dried malt is milled into a rather coarse flour and hot water is used to extract the sugar and achieve a sugary substance called "wort". Next yeast is added to the wort and it starts to ferment. Then it is distilled two or more times and finally ageing takes place by putting into casks to mature. This ageing process can take up to twenty-five years and more in some instances. What the casks are actually made of is quite critical to the taste, look and aroma of the finished product. A popular one is a re-used cask from American Whiskey production especially Bourbon. 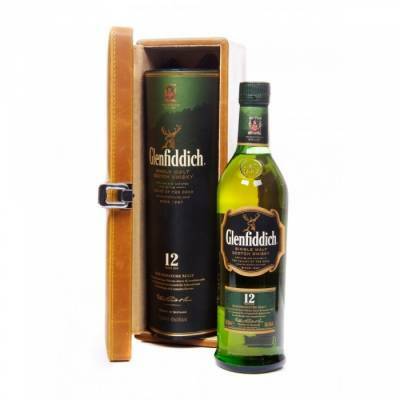 To get the best deals compare Whisky gift prices at www.greatestgifts.co.uk.